Electrocoin is a name which will be familiar to any UK players; this company has been a stalwart of the fruit machine industry since the mid-1970s and it’s games will be recognisable to many of us. 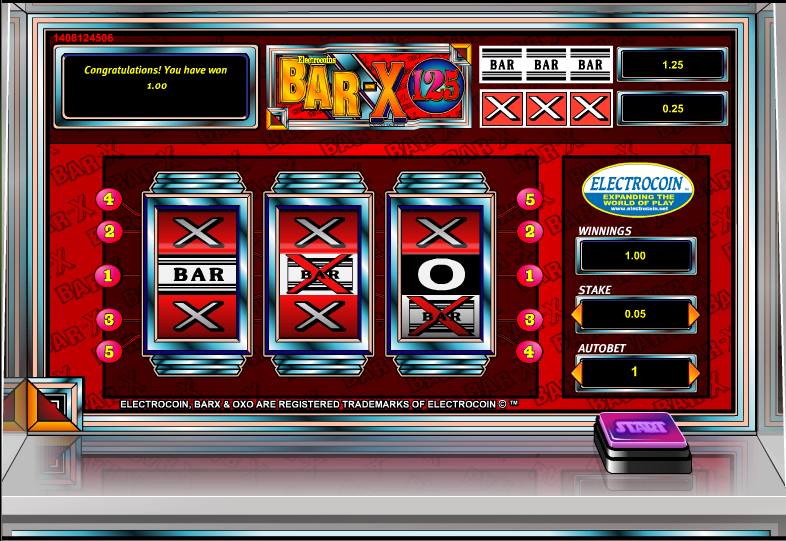 Bar-X 125 is an online recreation of one of those slots you see in amusement arcades rather than a pub fruit machine and it remains enduringly popular. Bar-X 125 is an extremely simple three reel slot but it does have five fixed payline which add a little bit extra. The game itself is a faithful recreation of the physical version and we particularly like the mirrored image on the shiny metal surface below the reels. There are only four symbol involved here and only three of those are helpful to you. Bars and ‘X’s will win you money if you can match them on a winning payline; the combines Bar/X is a wild which will substitute for the other symbols but the big white ‘O’ will win you nothing – which can be a disappointment the first time you land three on a winning payline. To start things off, just select your stake using the ‘Stake’ arrows to the right of the reels; you can bet from £0.05 to £250.00 per spin so this is suitable for low and high rollers. Just press ‘Start’ for a a single spin or use the ‘Autobet’ button to set up a number of spins in advance. Any winnings are displayed in the ‘Winnings’ box on the right hand side and the box in the top left hand corner will also also add helpful messages such as ‘unlucky’ if you fail to land a win. That’s all there is to it so feel free to enjoy this familiar arcade replica. If you’re looking for the genuine arcade experience without leaving the house then Bar-X 125 is certainly it; it looks, sounds and plays just like the original and it’s well worth checking out.